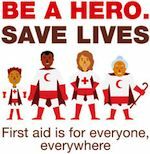 An annual event on the second Saturday in September, to raise awareness of how first aid can save lives. The open day is family orientated, marking the Journee Mondiale des Premiers Secours. Activities revolve around the theme of "Premiers secours et securite routiere" (first aid and road safety), and include introduction to basic first aid, road safety, workshops for kids, a bicycle track, demonstrations of rescues from car crashes, and a visit to an ambulance. The event helps to promote the mission and actions of the Red Cross's first aid section. It aims to encourage the public to take first aid courses that will help save lives. Organized by the Croix-Rouge Monegasque (CRM) in collaboration with the Government, Princess Grace Hospital, and the Association de la Prevention Routiere. For more information visit the Government website at: Gouvernement Princier: communique de presse: Journee Mondiale des Premiers Secours.